The wings and tail of an airplane behave as dynamic systems. When excited mechanically (for instance by turbulent flow), they vibrate. It can be shown, by aerodynamic theory, that the dynamic properties of these vibrations depend on the flight altitude and speed. 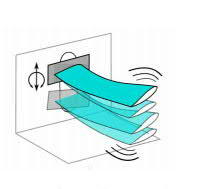 In fact, at very high speed, the interplay between the tail/wings and the air flow causes the observed damping of the wings to become negative, resulting in an oscillation with a rapidly increasing amplitude and, eventually, the wing/tail to break. This instability is known as flutter. It is clear that this instability must be avoided at all cost. During the certification phase, it must be demonstrated that the airplane is free from flutter throughout the entire flight envelope. Prior to these dangerous test flights, in-flight (but at low speeds) vibration measurements are required which allow to predict at which speed and altitude this flutter phenomenon occurs . The goal of this thesis is to determine the flutter speed by using system identification. Classically, the dynamics of the wings are determined at multiple, constant speeds. LTI (Linear Time Invariant) models are extracted from the measurements, and one aims at extrapolating the damping value to determine at which speed flutter will occur. The drawback of this approach is that the experiments are very slow and sensitive, and thus expensive: the plane needs to keep a steady speed, do the vibration measurements, and then accelerate to a new test point and repeat the procedure, for a fine grid of speeds and altitudes. In this thesis, we propose to use identification techniques for time-varying systems, or (more challenging) for parameter-varying systems, to allow that, during the experiments, the plane does not need to keep a steady constant speed. It can simply continuously accelerate. The resulting variations of the dynamics will be taken into account explicitly by the estimator. A proof-of-concept of this approach will be evaluated in the wind tunnel available at the Thermo and Fluid Dynamics (FLOW) research group, on a setup (known as the Active Aeroelastic Test Bench) which allows the arbitrary excitation of scaled models of wings.